Maybe you’ve noticed it in the bathroom mirror lately – your teeth just aren’t as bright as they used to be. You might have dark spots along the enamel or yellow discoloration that holds you back from showing off your smile. At Covina Family Dental, Dr. Tran wants to help you reclaim the picture-perfect look you deserve with professional teeth whitening solutions! Fast in-office treatment with Opalescence Boost and convenient take-home kits are both available, and patients can expect to improve their enamel by several shades following either approach. Contact us today here in Covina, CA to schedule a cosmetic consultation. How Does In-Office Opalescence Boost Teeth Whitening Work? 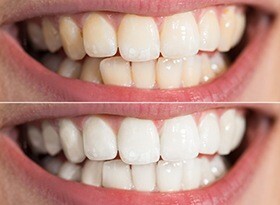 Are you wanting to whiten your teeth as fast as possible? Maybe you have a big event coming up where you’d like to look your very best, such as a wedding or a graduation ceremony. If so, in-office teeth whitening with Opalescence Boost is your best bet. 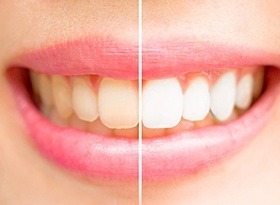 The process only takes one appointment at our Covina practice that will last around an hour, during which our team will apply a powerful whitening gel to the teeth in two 20 minute sessions. Your smile will appear noticeably brighter once we’re finished, and Dr. Tran will provide take-home gel and disposable trays as well so that you can do touch-ups at home. How Does At-Home Opalescence Teeth Whitening Work? Of course, some patients may want the convenience and flexibility of being able to whiten their teeth gradually at home. If this is the case for you, let our team know that you’re interested in a take-home Opalescence whitening kit. This system will consist of professional-strength whitening gel and oral trays that are custom-made for your unique smile. The patient’s only job is to wear both together as directed for a certain amount of time each day – this may be done for 30 minutes at a time or overnight, depending on your specific plan with Dr. Tran. Within a few weeks of consistent use, you should see beautiful improvements!